The music theory is not a new concept, it appeared quite a long time ago. 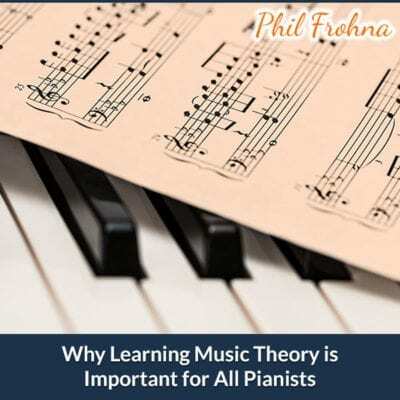 The music theory was taught to pianists and composers, even when learning to play the piano compositions enjoyed maximum popularity (in the 18th and 19th centuries) to enable them to understand the structure and functioning of music. The musical theory, in turn, directs the pianist when composing music, helps to combine various components and techniques. The theory of music teaches them to understand notations, letters, diagrams, chords and other symbols that an ordinary person may not understand. The pianist must perfectly know these signs and symbols in order to better understand, play or compose melodies, rhythms and tones with the help of a piano. Getting knowledge of the music theory, over time, you realize that the random pieces of music that you come across are not just notes. You will begin to recognize them in the sequences of chords and scales. Notes will no longer be scattered before you in a mess – you will begin to memorize them as a certain sequence. If you are a young beginner, you will perform simple theoretical tasks, in which you need to name notes and dynamics. This can be done in the form of an exercise or a game (for example, with cards). You will be able to memorize these lessons, and this will help you to read the notes, which is impossible without knowledge of the theory. You become a good performer in the orchestra! If, for example, you start playing in the orchestra of your school or at some other performance, knowing the music theory will make you a more valuable member of the team. If all orchestra musicians know the theory, their performance will be much better, as they will be able to better understand the notes and stay on the same wave and in one key. This will improve your critical listening skills! Just listening to music is a simple matter, whereas listening critically is like doing magic. Learning music theory will improve your critical listening skills. You can better understand and discuss what you hear. A musical performance involving pianos includes various major and minor series, nuances, melodies and other aspects that only a knowledgeable person will be able to identify. When you learn to identify music and discuss it critically, you will approach the level of a specialist. This will help understand and play difficult fragments! We do not say that studying music theory will make difficult fragments of works easy, but you will definitely find it easier to understand them, which means it’s a little easier to play the piano. You can compose your music! If your ultimate goal is to compose piano music, you definitely can not become a professional without studying the music theory. Music is an art. It is built around the expression of feelings. To add your thoughts and expression to music, they need to be recorded, and this is impossible if you do not know the notes. So if you really want to share your thoughts and expression in musical form with the world, you can do it right when you study notes, tempo, rhythm and dynamics, that is, music theory. It will make your musical journey more pleasant! Music theory helps you understand how music is arranged, and a precise understanding of how something works makes it possible to derive maximum benefit from this. The music theory gives you a complete understanding of how you can enjoy playing the piano using different scales, notes, melodies and rhythms. Is Music Theory Really Necessary? Without music theory, you would have to listen to a piece to understand what notes in it sound. You could not read and understand musical notations, which means you could not play. Without theory you can perform your music, but you can not share your composition with others. You can really learn how to play the piano with hearing, but you should understand that for a better understanding and professional study you should both know the music theory well and be able to play the piano from hearing. For beginners, especially young children and busy adults, sitting around studying music theory can really be boring and complicated, but believe me, it’s worth it. Despite the fact that it takes time and you can not learn everything in one day, the theory will open up such a potential in you that in the long run you will appreciate these lessons. This will not only help you play the piano better, but also later, if you want to do another instrument or anything else on your musical path, this will be your additional advantage.